So you figured you're fairy enough to wear Angelina Jolie's costume from Maleficent. The question is, which costume? 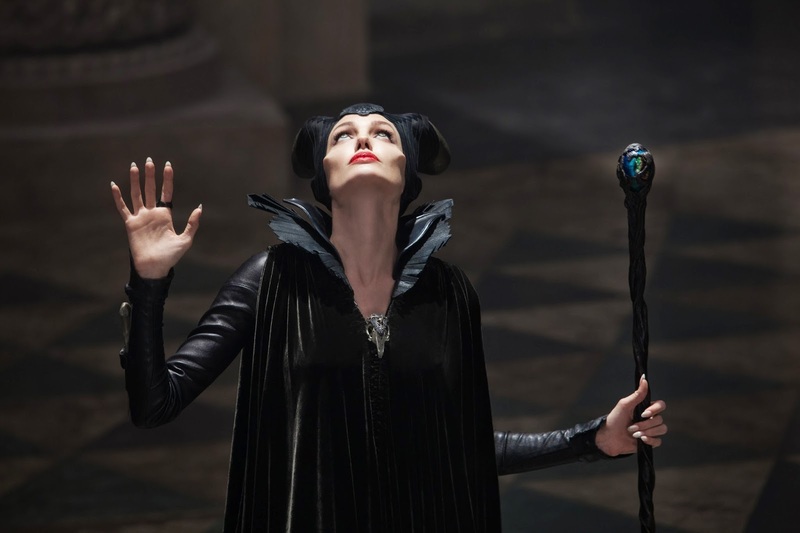 Angelina Jolie went through no less than nine costume changes to portray Disney's most famous gatecrasher. 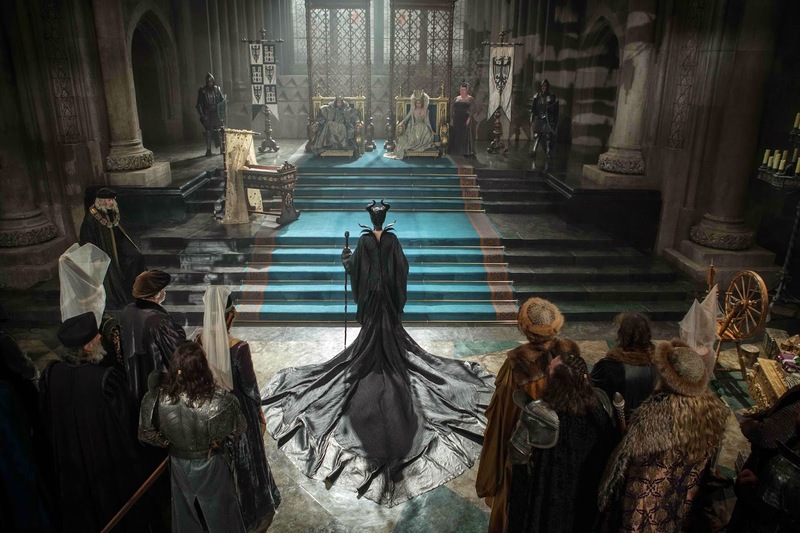 While the original Maleficent got by with her literally flaming robes, the Angelina-Jolie Maleficent pulled out all the stops in dressing up, slipping into everything from faux-fur-lined suede capes to pants. In all these, one thing—or two—remains consistent: the horns. In Sleeping Beauty, viewers couldn't wrap their heads (no pun intended) around Maleficent's horns. Were they really part of her head? Or were they really just kickass hennins typical of Medieval folk? You had no doubt, however, that she singularly embodied nefariousness beyond the first order. In Maleficent, by contrast, you are as certain of the horns' anatomical profile as you are confounded by the owner's rectitude. 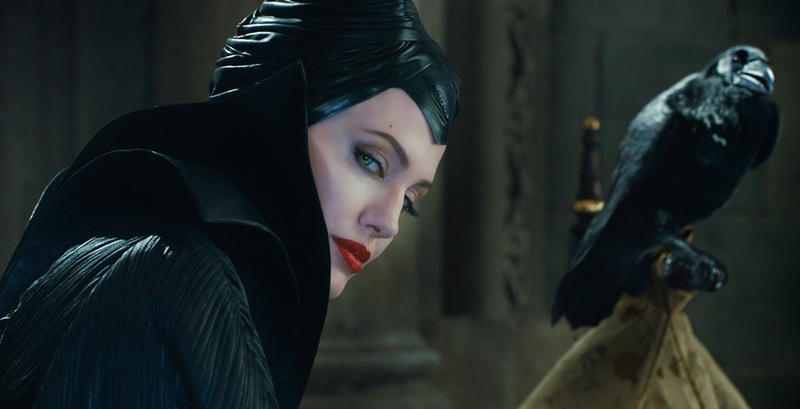 In any case, Jolie wore a total of six Maleficent headpieces. Horn-ily enough, milliner Justin Smith built them with the help of leather fetish artisans. He also wrapped the horns with exotic materials like python skin. Very un-PETA, you might say, but Maleficent is Mother Nature personified. These horns from Disguise also nail it. This one costs just 3 dollars! You can also make use of card stock and dixie cups. If you must pick one ensemble from Maleficent, it has to be the glittering assemblage of an outfit that Angelina wore at Aurora's christening. For this scene, costume designer Anna Sheppard used a textile evocative of Issey Miyake fabrics, with pleats that catch light. As with the animated Maleficent, this sculptural masterpiece has enormous batwing sleeves, to emphasize the character's monstrosity, minus the purple accents. If you can't sew a basic Halloween robe to go with the collar, or if you want one with batwing sleeves, never underestimate the power of a graduation toga. This Maleficent goes around without her signature purple eyeshadow. For some reason, Angelina felt it would detract from her performance more than sanguine lipstick and prosthetic cheekbones. For the latter, SFX makeup artist Rick Baker derived inspiration from Lady Gaga's "Born This Way" video. "If you look closely, they actually follow the line of Maleficent’s cowl in the Disney cartoon,” Baker explained. 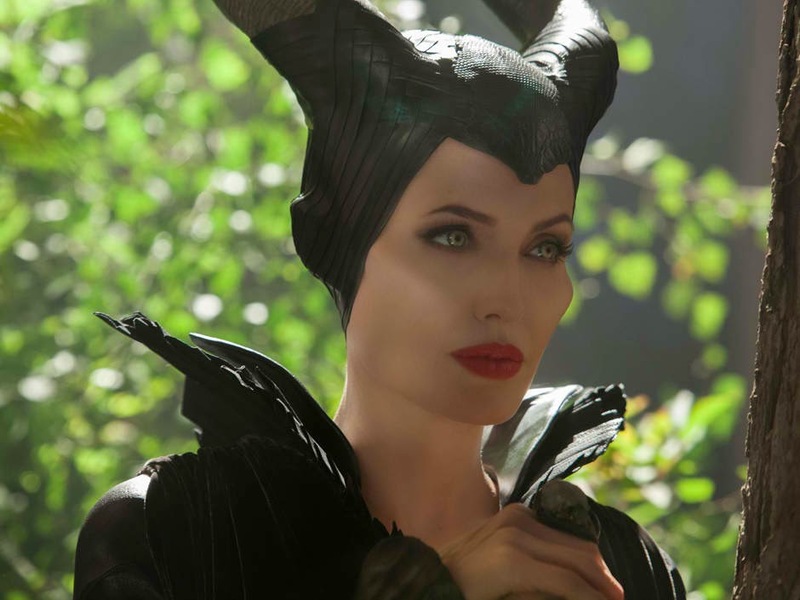 Here are tips for cheekbone contouring a la Maleficent from Angelina's personal makeup artist herself, Toni G.
Are your cheekbones too shy to come out? You can always add prosthetic ones on the cheap like AllSeeBee. While the animated Maleficent had inimitably jaundiced eyes, with no more than pinpricks for irises, Angie's version can be mimicked with the right contact lenses. Hers was specially hand-painted, at her request, to resemble the horizontal pupils of a goat. "Usually I’m the one pushing for prosthetics and weirdness, and it was kind of the reverse on this film,” Baker conceded. This and her penchant for vials of blood prove Angelina is one black-magic woman in real life. 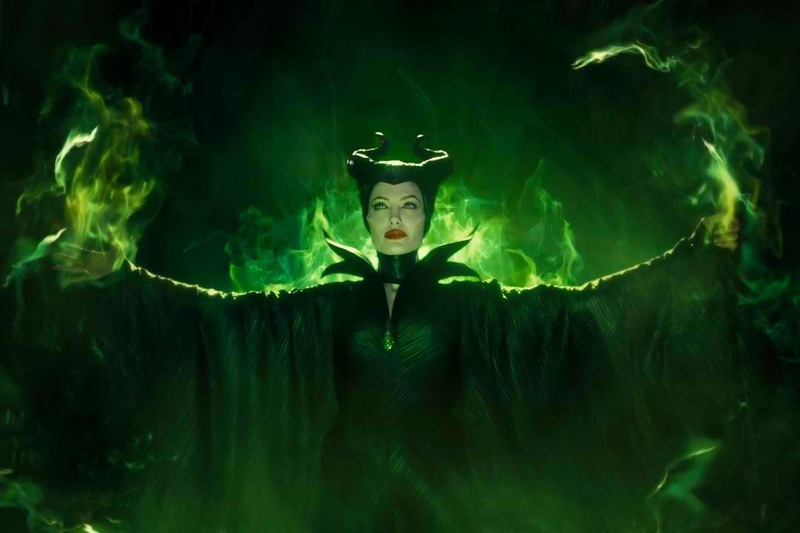 Maleficent's staff was the nucleus of her power in Sleeping Beauty. It was made of metal; you can certainly remember the sound it made when she bade the royal court to listen to her curse. In the live-action movie, however, the staff serves more as a walking aid, and it is wooden, topped by a blue-green orb. Whereas the past Maleficent would have you carrying around a plush raven, this time you can tag along a live person as props. (Spoiler in the next sentence.) Apparently, the new Maleficent keeps a pet raven that transforms into a human, Diaval. A great idea for couples on Halloween, if anything. Listen well, all of you. You don't need to circle far and wide to find your Maleficent fancy dress. With smart decisions in the wardrobe and makeup departments, you can lessen your risk of being a disgrace to the forces of evil. How to dress as Maleficent, the animated version, here.